Patients and clinicians have different expertise when it comes to making consequential clinical decisions. While clinicians know information about the disease, tests and treatments, the patient knows information about their body, circumstances, goals for life and healthcare. It’s only on patient-clinician collaboration to make decisions together that the ideal of evidence-based medicine can come true. This is especially pertinent to treating depression as there are many treatment options with no clear winner in terms of efficacy. User Research: Worked with researchers at Mayo Clinic to observe interactions between depression patients and doctors. Interaction Design: Identified design goals, formulated design strategy, created wireframes and interactive prototype for the design. Visual Design: Designed production-ready visuals for the application. Fluid interaction that doesn't interrupt conversation. Can’t have tutorial, interactions should be minimal and supportive of both patients and clinicians. Avoid quantification/calculations that equates medications. Mayo Clinic's Knowledge and Evaluation Research (KER) Unit has developed a brochure consisting of 5 cards, known as decision cards, which enlist various side effects such as weight, sleep, sexual issues, withdrawal symptoms. The series of physical cards are used by the physician after identifying the problem faced by the patient, as an aid for himself as well as the patient to visually compare the various side effects of a medication and to decide which drug to take, based on the patient’s expectations from the drug. However, paper-based artifacts are difficult to update when information about a medicine changes and they have to be printed again which is costly. Also, since the printed version has to be reused again and again with several patients, the physicians and patients cannot mark anything on it which makes comparisons of medications cumbersome. In order to deal with these problems, we decided to design a digital version of the cards, which has more scalablity and modularity than the printed version. We began by conducting an interview with Ian and Maggie, the designers at Mayo, to clarify the problem space. To understand users’ requirements, we studied 3 videos from Mayo showing the usage of the brochure during actual clinical encounters. 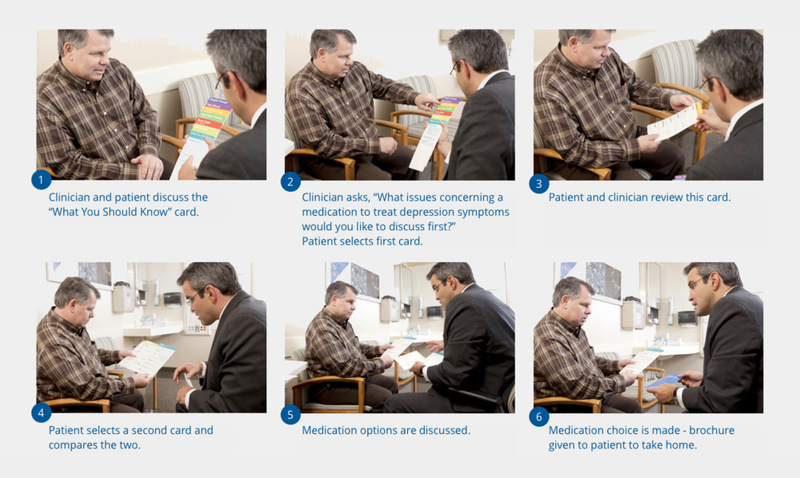 The physician first introduces the cards to the patient in a stack and starts talking about the which problem the patient is most concerned about. The patient then selects a card and goes on to review the card along with the physician. During this process, they also discuss if the patient has suffered from depression before and if he/she has taken any other depression medications. They then go through different cards and compare medicines across cards to come to a conclusion about which medicine to take. We created 10 design variations during two rounds of brainstorming. From wearable technology to novel interfaces, we explored a range of mediums. We also came up with a companion idea of a removable room to relieve stressfulness between patients and physicians and encourage conversation. Since the main aim of the system is to support conversation between two people, we realized that we needed a tool that could be easily passed back and forth and invited editing it rather than something more intimidating. We finally decided to design for the tablet. After 7 rounds of in-class critique followed by clean-up sessions, we created two different prototypes. The first prototype is based on an information visualization design method that uses parallel coordinates to present all options (overview) while facilitating comparison and selection (drill down) in more than one shared decision-making scenario. The second tool follows a more sequential process based design method. The visual language aims to give physical form (of cards) similar to the current brochure. The thumbnail section gives a contextual overview of the user's selection. 3 within-group subjects, with randomized prototype order, were assigned benchmark tasks and asked to think aloud while interacting with the prototype. We then collected qualitative feedback via brief semi-structured interview sessions. Prototype 1: Users commented on the fluidity and colorfulness of the interface and liked that they could see everything on a single page at one time. They liked the simple interaction mechanism base on clicking. However, they also agreed that discovering features triggered by double-click or long-hold would require instruction from other people. Prototype 2: Users liked the thumbnail for its interactions (e.g. reordering) and indication of state. They also felt like this prototype allowed for more specific comparison of drugs. However, they admitted to finding the number callout for each factor confusing. Targeting special population, such as children, the elderly etc. from the beginning can be a good way to achieve better usability in the end. Icons can be overvalued. Sometimes text is more effective. Role playing and conversation flow can be a good way to present prototypes. Never be afraid to start over. User research runs through the entire design process.